I had to have my signature freckle removed this week. It had been giving me issues for awhile, so I bit the bullet and went to see the dermatologist. She wanted to remove it (yikes!) for biopsy, which had me shakin' in my boots, but turned out when she scraped it off my poor little cheek, she found a cyst, which was most likely the cause of all the freckle-strife. To be on the safe side we are going to have the biopsy anyway, but hopefully now that the cyst has been removed (she cut it out. ugh.) all the problems will cease. I was a bit more emotional about having a crater carved in my cheek than I thought I would be, but I mean come on, it's my face! So I asked my ever accommodating hubby to stop and get some "cute" band-aids, bc the round beige thing just wasn't doing it for me. 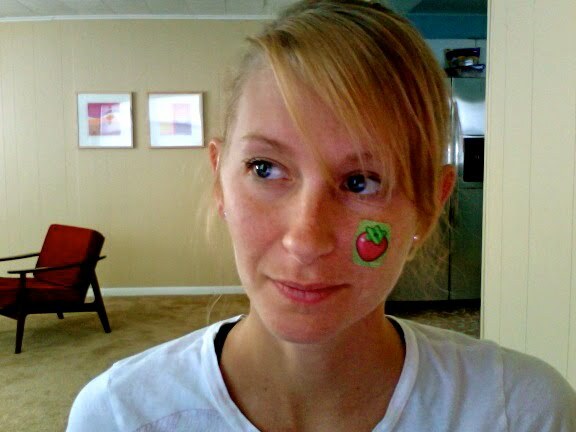 So we picked up some of these adorable Strawberry Shortcake ones, and with my fading hair color it seemed apropos. We are getting John all ready for his send off, he is leaving early, early tomorrow morning for a 10 day "boys only" surf trip to Nicaragua. (Don't feel too bad for me, we are going on a little surf adventure together in June...) I am trying to not be sad, but I will definitely miss my boy! But in an attempt to ward of a lonely heart I am compiling a list of goals for the next ten days to keep me occupied! I hope everyone had a great week and woot-woot for the weekend! Ashley, you are super cute!! 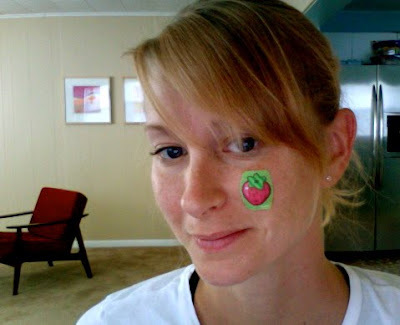 what a good excuse to flaunt around a fun sticker.